Television networks, communications service providers and MSOs are innovating new ways for consumers to watch major sporting events such as the 2016 Rio games and the 2018 winter games in PyeongChang. Although NBC's coverage of the 2016 Summer Olympic Games in Rio drew audiences three times larger than ABC, CBS and Fox combined, traditional viewership was 17% down from the 2012 games in London. However, Rio broke records for online viewership. 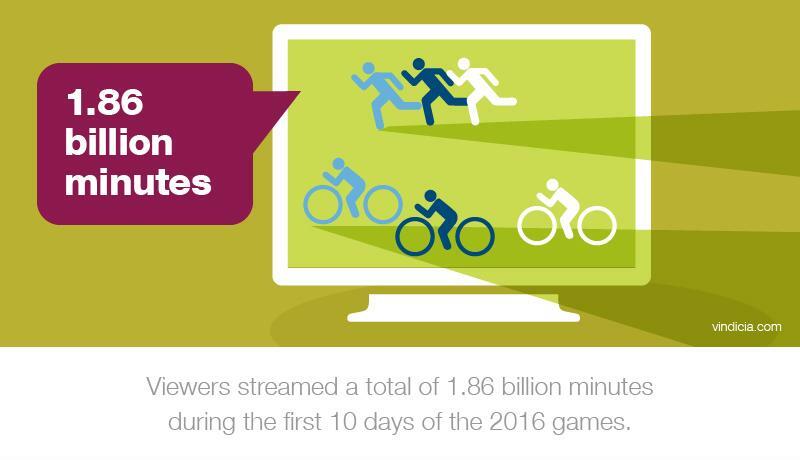 According to the L.A. Times, users streamed a total of 1.86 billion minutes of the event during the first 10 days on this channel—more than the total of the 2012 games in London and the 2014 games in Sochi, Russia, combined. Streaming viewers have increased significantly in 2016. To capture viewers, NBC partnered with Comcast to showcase the event via Comcast's Xfinity X1 platform. The platform offered an innovative dashboard through which subscribers could observe the games on their terms: by watching various networks showing the games as they aired or by searching for a specific sport, athlete or nation. From the dashboard, users could also access NBC Live Extra, which let them view any and all streaming feeds. This in and of itself was a fantastic new offering, but the NBC/Comcast partnership offered more: the XFinity Sports App. This gave viewers instant access to even more information, such as competitor statistics, rankings and bios. The app even allowed customers to observe scores in other sports without interrupting their current viewing experience. What's more, they could "favorite" specific athletes for quick access. The app also featured voice recognition capabilities. Through this partnership, NBC and Comcast offered an incredibly in-depth immersive experience—one that clearly paid off, given the numbers cited by the L.A. Times and the advertising budgets they pocketed. The technological landscape is already heating up for the next major international sporting event. In Europe, Eurosport, owned by Discovery Networks, is preparing to give viewers online access to the winter games in PyeongChang, South Korea. According to the Discovery press release, the broadcaster's Eurosport Player service will let consumers watch over 4,000 hours of sports coverage—including 900 hours of live events—on various devices. The network will also use over 1,100 cameras to capture the competitions. "PyeongChang 2018 marks the first Olympic Games of our ground-breaking long-term partnership with the International Olympic Committee," said Jean-Bria Perette, president and CEO of Discovery Networks International. "We know that viewers want more: more access to their local heroes, more expertise and more ways to watch the Olympic Games, and this is exactly what we are bringing to fans across Europe." "For the first time, the games will be completely available in a digital format for European viewers." As with the NBC/Comcast partnership, Eurosport subscribers will be able to customize their sports-viewing experience with features like the Make It Yours campaign and the Eurosport Cube studio, which will incorporate data analysis and augmented reality for heightened consumer immersion. According to the announcement, this partnership marks the first time the games will be completely available in a digital format for European viewers. Additionally, Eurosport earlier announced a partnership with Snap Inc. to bring the platform's European users exclusive content, another first. Eurosport will work with athletes and influencers to attract a younger audience through the Snapchat app. Through the collaboration, Eurosport will curate stories featuring various aspects of the event and showcase original content created with Eurosport games footage. Discovery has good reason to believe the Snap Inc. partnership will be successful. Earlier this year, the two collaborated to create "Shark Week on Snapchat," which drew over 17 million viewers over the course of a week, according to the partnership announcement. Will digital viewership increase for the 2018 games? As viewing habits change, it seems reasonable to expect a substantial move from traditional to online viewing, also at the winter games. This is due to the growing preference for digital, but also due to the nature of sports. While viewers are willing to wait anywhere from one day to a few months to watch drama series or comedies on their favorite platforms, consumers want to watch sporting events live. The thrill of these events comes from viewing and discussing them in real time. And as viewership increases and become more sophisticated across multiple channels and devices, the TV networks and service providers can look for new ways to monetize major sporting events.